Dakar, the largest city of Senegal, is located on the Cape Verde Peninsula, Africa's westernmost point. It is Senegal's political, cultural, and economic capital, and one of Tropical Africa’s leading industrial, financial, and service centers. It is considered one of West Africa’s most important and vibrant cities. Its bustling and cosmopolitan atmosphere compares with some European cities, owing to more than a century of French rule. Dakar is a major transit point for Atlantic Ocean and European trade. Its location significantly helped Dakar's growth into a regional port. 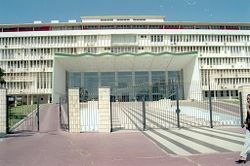 An administrative center, Dakar is home to the National Assembly of Senegal and the Senegal Presidential Palace. 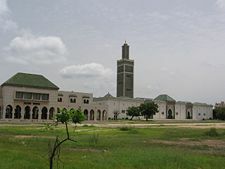 Attractions include the Dakar Grand Mosque, built in 1964; Gorée Island, a World Heritage Site because of its role in the West African slave trade; and the IFAN Museum, one of the most prestigious centers for the study of West African culture. Clifftop walks, beaches, and Hann Park, home to Senegal's zoo add to Dakar's presence. Senegal is economically stronger than its neighbors, due to Dakar, and remains a stable democracy. Its first president, Léopold Senghor was elected in 1960, and handed power to his successor, Abdou Diouf, peacefully in 1981. Afterward, the country moved from a one-party state to a multiparty democracy. Senegal faces high unemployment and relies heavily upon outside donor assistance. Senegal's problems exist in Dakar as well, though generally less pronounced. 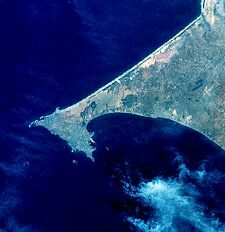 Satellite image of Cape Verde Peninsula; Dakar is located on its tip. The name Dakar derives from dakhar, a Wolof name for the tamarind tree, and the name of a coastal Lebu village located south of where the port's first pier was built. Located midway between the Gambia and Senegal Rivers, on the southeast of the Cape Verde Peninsula, Dakar is the westernmost African city. The city has a tropical climate, but the characteristic heat and humidity are moderated in the city by cool breezes. The average maximum daytime temperature in January is 79°F (26°C), dropping to an average maximum of around 88°F (31°C) in July. The rainy season, between June and November, brings heavy downpours along with strong southeasterly winds. The dry season, from December to May, is exacerbated by the hot, dry and dusty Harmattan West African trade wind. Mean annual precipitation is 21 inches (542mm). The commune d'arrondissement of Dakar-Plateau, on the southern part of the peninsula, is the historical heart of the city, and most public buildings, hospitals, and embassies are located there. Adjacent, to the west, is the most densely populated arrondissement of Médina. The business district is located to the north. The port, the fishing harbor, and peanut-export facilities are located to the north and east, while the industrial estate of Hann is further north. A map by Guillaume Delisle (1770). Postcard image of Dakar under French colonial governance, 1900. HMS Ark Royal and some of its Fairey Swordfish in the Battle of Dakar. 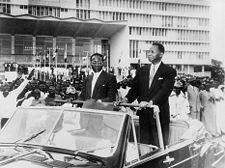 Léopold Sédar Senghor and Mamadou Dia, the first President and Prime Minister respectively of the Republic of Senegal, pass the National Assembly building in Dakar, 1960. Abdoulaye Wade, President of Senegal, at the meeting of the World Economic Forum at the Waldorf-Astoria hotel in New York on February, 1, 2002. Image courtesy of W.E.F., photo by Marcel Bieri. The Cape Verde Peninsula was settled, no later than the fifteenth century, by the Lebou, an ethnic group related to the neighboring Wolof and Sereer. The original villages, Ouakam, Ngor, Yoff and Hann, still constitute distinct Lebou neighborhoods of the city. In 1444, the Portuguese arrived on the island of Gorée and founded a settlement there. By 1536, it was a base for the export of slaves. The mainland of Cap-Vert, however, was under control of the Jolof Empire as part of the western province of Cayor which seceded from Jolof in 1549. A new Lebou village, called Ndakarou, was established directly across from Gorée in the seventeenth century to service the European trading factory with food and drinking water. Gorée was captured by the United Netherlands in 1588, which gave it its present name (spelled Goeree, after Goeree-Overflakkee in Holland). The island was to switch hands between the Portuguese and Dutch several more times before falling to the English under Admiral Robert Holmes (1622-1692) on January 23, 1664, and finally to the French in 1677. Though under continuous French administration since, Métis families, descendants of Dutch and French traders and African wives, dominated the slave trade. The infamous "House of Slaves," said to be the final exit point of slaves from Africa, was built there in 1776. In 1795, the Lebou of Cape Verde revolted against Cayor rule. A new theocratic state, subsequently called the "Lebou Republic" by the French, was established under the leadership of the Diop, a Muslim clerical family originally from Koki in Cayor. 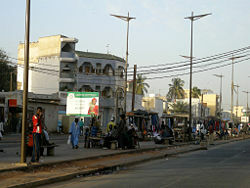 It's capital, called Ndakarou, was established at the present site of Dakar. In 1857, the French established a military post there, called it "Dakar," and annexed the Lebou Republic. The Senegalese State recognizes the Serigne (also spelled Sëriñ, "Lord") of Ndakarou as the traditional political authority of the Lebou. The French abolished the slave trade in February 1794, Napoleon reinstated it in May 1802, then finally abolished it permanently in March 1815, although a clandestine slave trade continued at Gorée until 1848. The French promoted peanut cultivation on the mainland to replace trade in slaves. As the peanut trade boomed, traders from Gorée decided to move to the continent and established a "factory" with warehouses in Rufisque in 1840. Colonial authorities improved the port with jetties, a telegraph line was established along the coast to Saint-Louis and the Dakar-Saint Louis railway was completed in 1885, at which point the city became an important base for the conquest of the western Sudan. Gorée, including Dakar, was recognized as a French commune in 1872. Dakar itself was split off from Gorée as a separate commune in 1887. The citizens of the city elected their own mayor and municipal council and helped send an elected representative to the National Assembly in Paris. Dakar replaced Saint-Louis as the capital of French West Africa in 1902. A second major railroad, the Dakar-Niger, was built from 1906–1923, linked Dakar to Bamako, and consolidated the city's position at the head of France's West African empire. In 1929, the commune of Gorée Island, now with only a few hundred inhabitants, was merged into Dakar. Following a plague epidemic in 1914, the authorities forced most of the African population out of old neighborhoods, or "Plateau," and into a new quarter called Médina, separated by a "sanitary cordon." As first occupants, the Lebou inhabitants of the city resisted this expropriation, with support from Blaise Diagne (1872-1934), the first African to be elected Deputy to the French National Assembly. Nonetheless, the Plateau became an administrative, commercial, and residential district increasingly reserved for Europeans and served as model for similar exclusionary administrative enclaves in French Africa's other colonial capitals (Bamako, Conakry, Abidjan, and Brazzaville). Meanwhile, the Layene Sufi order, established by Seydina Mouhammadou Limamou Laye (1843-1909), was thriving among the Lebou in Yoff and in a new village called Cambérène. In its colonial heyday, Dakar was a major city of the French Empire, comparable to Hanoi or Beirut. 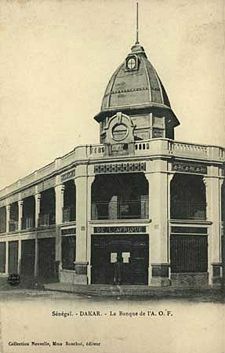 French trading firms established branch offices there and industrial investments such as mills, breweries, refineries, and canneries were attracted by its port and railway center. It was also strategically important to France, which maintained an important naval base and coaling station in its harbor and which integrated it into its earliest air force and airmail circuits, most notably with the legendary, but no longer existent, Mermoz airfield. By the 1930s, Dakar had become West Africa's main port for shipping peanuts. During the World War II Battle of Dakar, which took place off the coast of Dakar on September 23, 1940–September 25, 1940. The British navy attempted to rally the colonial administration in Dakar to the Allied cause and detach it from the Vichy regime of occupied France. In November 1944, West African conscripts of the French army mutinied against poor conditions at the Thiaroye camp, on the outskirts of the city. The mutiny was seen as an indictment of the colonial system and constituted a watershed for the nationalist movement. Dakar was the capital of the short-lived Mali Federation from January 1959, which became fully independent on June 20, 1960. The federation dissolved on August 20, 1960, and Dakar became the capital of Senegal. Léopold Senghor (1906-2001), an internationally known poet, politician, and statesman, was elected Senegal's first president in August 1960. 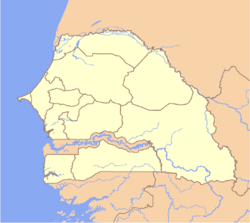 Senegal joined The Gambia to form the nominal confederation of Senegambia on February 1, 1982. However, the envisaged integration of the two countries was never carried out, and the union was dissolved in 1989. With nearly one million inhabitants, the commune of Dakar was deemed too large to be managed by a central municipality, and thus on August 30, 1996, the city was divided into 19 communes d'arrondissement, which were given extensive powers. 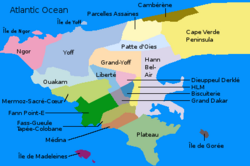 The 19 communes d'arrondissement belong to either of the four arrondissements of Dakar, with a sous-préfet in charge of each. In 2000, Abdoulaye Wade (b. 1926), the leader of the opposition (Senegalese Democratic Party), defeated President Abdou Diouf (Socialist Party of Senegal). In local body elections on May 12, 2002, Pape Diop (b. 1954) was elected mayor of Dakar, defeating the long time socialist mayor Mamadou Diop, while Abdoulaye Wade was elected president of the regional council of the Dakar région, defeating the socialists. France maintains an air force base at Yoff and the French fleet is serviced in Dakar's port. The Assemblée nationale on the Plateau, the heart of old Dakar. Senegal is a republic in which the president, who is chief of state, is elected by popular vote for a five-year term, and is eligible for a second term. The prime minister, who is head of government, is appointed by the president. The bicameral parliament consists of the National Assembly of 150 members elected by a mix of direct popular vote and proportional representation to serve five-year terms, and the Senate, comprising 100 seats, of which 35 are indirectly elected, and the remaining 65 members appointed by the president. 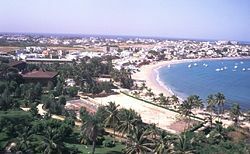 The city of Dakar is both a commune, one of the 67 communes of Senegal, and a département, a local administrative structure of the central state, one of the 34 départements of Senegal. The département of Dakar is one of the four départements of the Dakar région, which in turn is one of the 11 régions of Senegal. The Dakar région encompasses the city of Dakar, the region's capital, and all its suburbs along the Cape Verde Peninsula—roughly the metropolitan area of Dakar. The département of Dakar is divided into four arrondissements: Almadies, Grand Dakar, Parcelles Assainies (Dakar's most populated arrondissement), and Plateau/Gorée (downtown Dakar). The commune of Dakar is ruled by a democratically elected municipal council (conseil municipal) serving five years, and a mayor elected by the municipal council. Market street in the working class Gueule Tapée quarter. Senegal is economically stronger than its neighbors due to a well-developed infrastructure, diversified industrial base, and because it is the economic hub of the region and the most visited country in West Africa. Services contributed 57 percent of gross domestic product (GDP) in 1999. The primary sector accounted for 20 percent of GDP and supports almost 75 percent of the economically active population. Fish is the main export earner, although resources are depleted. Phosphates and chemicals constitute Senegal’s second-largest source of export earnings. The industrial sector, which accounts for about 20 percent of GDP, depends on agro-industries and mining. Dakar is a regional industrial, service center, and financial center. The city is home to a dozen national and regional banks (including the BCEAO which manages the unified West African currency), and to numerous international organizations, non-governmental organizations, and international research centers. Manufacturing industries include refining petroleum and peanut-oil, canning fish, milling flour, brewing, and assembling trucks. 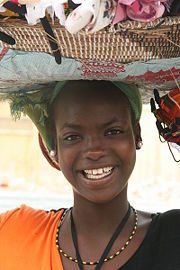 Senegal's per capita GDP was estimated at $1700 in 2007. Buses and minibuses operate on the main routes linking Dakar to other cities and towns in Senegal. The most common form of transportation is the car rapide—colorfully painted vehicles that are crowded and sometimes unsafe. Taxis are available. Dakar is the terminus of the Dakar-Niger railroad line. Dakar port is sheltered between two jetties, has a draft of 50 feet (15 meters) at the harbor entrance, and has a container berth with one mobile container crane. Léopold Sédar Senghor International Airport, located to the north of the city, is a stopping point for flights between Europe and South America. It was a Space Shuttle landing site until it was determined that a dip in the runway could damage the shuttle upon landing. In 2007, the airport served about 2,100,000 passengers. According to December 31, 2005 official estimates, the city of Dakar proper had a population of 1,030,594, whereas the population of the Dakar metropolitan area was estimated at 2.45 million people. Since independence, urbanization has sprawled eastward past Pikine, a commuter suburb whose population (2001 est. 1,200,000) is greater than that of Dakar proper, to Rufisque, creating a conurbation of almost 3 million (over a quarter of the national population). Dakar has a large Lebanese community (concentrated in the import-export sector) that dates to the 1920s, a community of Moroccan business people, as well as Mauritanian, Cape Verdian and Guinean communities. The city is home to as many as 20,000 French expatriates. Otherwise, Wolof make up 43.3 percent of the population, Pular 23.8 percent, Serer 14.7 percent, Jola 3.7 percent, Mandinka 3 percent, Soninke 1.1 percent, European and Lebanese 1 percent, other 9.4 percent. French is the official language, while Wolof, Pulaar, Jola, and Mandinka are also spoken. Muslims account for 94 percent of the population, Christian 5 percent (mostly Roman Catholic), indigenous beliefs 1 percent. Cheikh Anta Diop University, also known as the University of Dakar, which was established in 1957, has an enrollment of over 60,000 students. Notable people born in Dakar include: Rhythm & Blues singer Akon, French politician Ségolène Royal, singer and percussionist Youssou N'Dour, soccer players Patrick Vieira (Inter Milan), Patrice Evra (Manchester United) and Macoumba Kandji (Atlanta Silverbacks) as well as basketball players DeSagana Diop (Dallas Mavericks), Boris Diaw (Phoenix Suns), and Cheikh Samb (Detroit Pistons). Dakar is the finishing point of the Dakar Rally, formerly known as "The Paris to Dakar Rally" and now as "The Lisboa Dakar," which is an annual off-road race, organized by the Amaury Sport Organisation. Amateurs typically make up about 80 percent of the participants. Despite its name, it is an off-road endurance race, called a rally-raid rather than a conventional rally. The terrain the competitors traverse is much tougher and the vehicles used are true off-road vehicles rather than the modified sedans used in rallies. 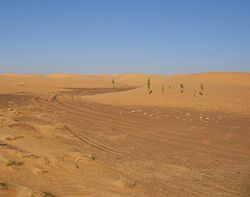 Most of the competitive special sections are off-road, crossing dunes, mud, camel grass, rocks and erg among others. The distances of each stage covered vary from several kilometers up to 500–560 miles (800 to 900 km) per day. Residential street in the upscale Mermoz quarter. Senegal is economically stronger than its neighbors, and remains one of the more stable democracies in Africa. Its first president Leopold Senghor handed power to his successor Abdou Diouf peacefully in 1981, and since then the country has moved from a one-party state to a multiparty democracy. Diouf served four terms as president. 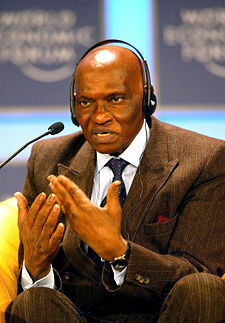 In 2000 he stepped down following defeat in general elections to opposition leader Abdoulaye Wade. Senegal experienced its second peaceful transition of power, and its first from one political party to another. Diouf encouraged broader political participation, reduced government involvement in the economy, and widened Senegal's diplomatic engagements, particularly with other developing nations. Domestic politics on occasion spilled over into street violence, border tensions, and a violent separatist movement in the southern region of the Casamance. Nevertheless, Senegal's commitment to democracy and human rights has strengthened over time. Dakar faces the same problems that Senegal faces. High unemployment continues to prompt illegal migrants to flee Senegal in search of better job opportunities in Europe. And Senegal still relies heavily upon outside donor assistance. However, despite the economic and social problems, the lack of ethnic strife and the political and economic liberalization slowly taking provides for stability and give grounds for hope. Dakar’s position makes it well suited for Atlantic Ocean and European trade and has helped its growth into a regional port. In addition to being an administrative center, Dakar is a regional industrial, service, and financial center and is considered not only one of West Africa’s, but also Tropical Africa’s, most important cities. ↑ L'opposant Khalifa Sall élu maire de Dakar. AFP. 18/04/2009. Retrieved April 11, 2012. ↑ (French)Tableau de répartition de la surface totale occupée. Retrieved March 8, 2007. ↑ 3.0 3.1 (French) Agence Nationale de la Statistique et de la Démographie, Government of Senegal. "Situation économique et sociale du Sénégal," édition 2005, page 163 (PDF). Archived from the original on 2007-06-15. Retrieved March 8, 2007. Africa Fact Files. Senegal. Retrieved September 12, 2008. Gellar, Sheldon. 2005. Democracy in Senegal: Tocquevillian analytics in Africa. New York: Palgrave Macmillan. ISBN 9781403970275. Gellar, Sheldon. 1982. Senegal—an African nation between Islam and the West. Boulder, Colo: Westview Press. ISBN 9780566005510. Lutz, William. 1988. Senegal. New York: Chelsea House Publishers. ISBN 9781555461928. World Fact Book. 2008. Senegal. Retrieved September 10, 2008. This page was last modified on 11 July 2016, at 20:02.